For some unfortunate reason, people decide to kill other people. Through this reality, the Australian government unanimously decided to create comprehensive gun laws including criminal background checks, 28-day waiting periods, and a “justifiable” reason other than self-defense for owning a firearm. In addition, Australia enacted strict gun laws that banned semi-automatic rifles and shotguns, all in order to combat the senselessness and the unpredictability of gun violence. Australia’s last mass shooting occurred 22 years ago, in 1996. With some unknown cause, Martin Bryant took the lives of 35 individuals with a semi-automatic AR-15. But since then, Australia has been virtually free of mass shootings. Obama said this in 2015. Since then, around 185 people have been killed in America by way of mass shootings—185 people killed in less than 3 years. The most recent shooting took place in a high school in Florida. Seventeen people died on Valentine’s Day and the National Rifle Association responded with some condolences before reflecting the blame. “Blaming guns is not a rational response. First of all, guns don’t commit crimes all by themselves…” Prior to these statements, President Trump tweeted, “So many signs that the Florida shooter was mentally disturbed, even expelled from school for bad and erratic behavior. . . Must always report such instances to authorities, again and again!” This broad statement is widely agreed upon by the public. Nonetheless, Stephen Paddock, who killed 58 people in Las Vegas, had no background indicative of violent behavior, only depression and anxiety. 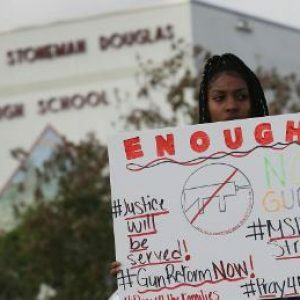 Moving forward, national legislators are considering background checks, gun laws, and better mental health programs in order to combat mass shootings. « Previous Article Black Panther: What Impact Will It Have on Current and Younger Generations?